I hope this newsletter finds you well. For most of this week, I've been happy to assist the LAPD as a civilian interview panelist for the hiring of their Police Commanders, which is the level above their Captains and under their Assistant and Deputy Chiefs. I was extremely impressed with the caliber of the candidates and learned a lot about the future of the LAPD and its community policing collaborations, of which many Neighborhood Councils are already playing a part. I stopped by our newest Neighborhood Council alliance last night: Alliance of River Communities (ARC@EmpowerLA.org), which includes the Central East and North East Los Angeles Neighborhood Councils that have an interest in the rehabilitation of the Los Angeles River. In fact, last night, they heard a great presentation from the Friends of the LA River about the future development plans. Today, Mayor Garcetti began his Government 101 classes again. 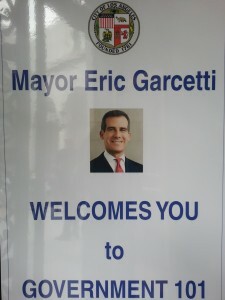 When I first started with the City almost six years ago, Mayor (then Councilmember) Garcetti was the only person offering this basic orientation of how to connect with City Hall. We provided information on Neighborhood Councils, elections and the annual Congress of Neighborhoods for his info packets as well as our famous Keep Calm and EmpowerLA backpacks. It's a great introduction about the ins and outs of City Hall, and I highly recommend it. As always, thanks for all that you do to Empower LA! Congress of Neighborhoods "Bridging the Gap"